This weekend was all about the studio. From Friday after work until now, Sunday evening, it’s all been about the studio one way or another. Friday after work, we had a small, informal get-together at the studio. It was mostly just folks that had something to do with the studio’s coming to be, one way or another. We had some light refreshments including Tokyo Kinston’s avacado sushi and sweet potato sushi. And Mother Earth’s beers. The party lasted from 5 until 7 and its was a lot of fun. It was also a nice warm-up for the bigger open house we’re planning for May or June. Picking up the studio's first load of clay from Fat Cat Pottery in Wilmington. 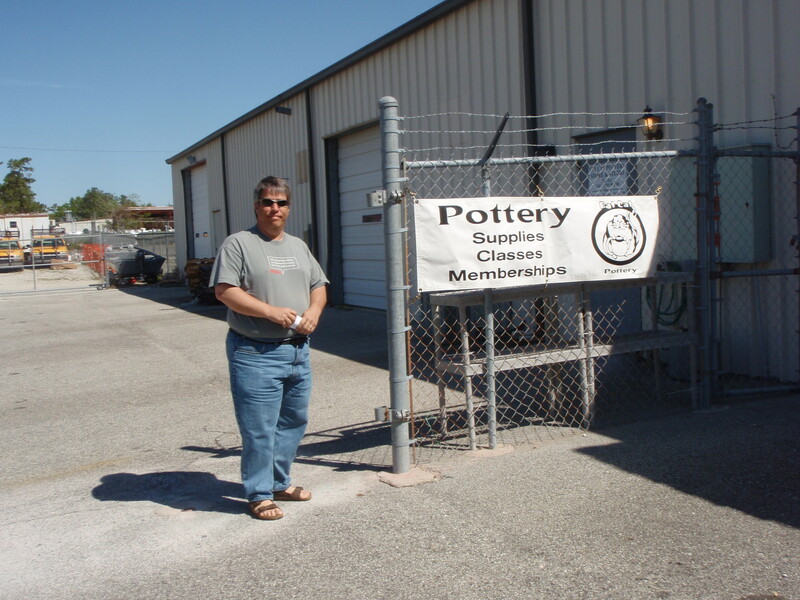 Saturday morning, Dad and I headed for Fat Cat Pottery in Wilmington to pick up my first load of clay and glazes. We started about 9 and got there a bit after 11:00am. 300 lbs of clay (200 lbs. of Standard’s #122 and 100 lbs. of #266), and 3 custom glazes from Fat Cat (Crystal Blue Green, White, and Clear) later and we were on our way back home. There was a brief side trip to J. Michael’s Philly Deli at Monkey Junction to keep our strength up. After unloading, I went home and mowed the grass and did some shopping, planning to start on Sunday. That didn’t work. I threw my first bowl in the new studio, on the new wheel, with the new clay Saturday night about 8:00pm. Dad came over and shot some video of the occasion. Sunday a little past noon, I headed for the studio with the intent of cleaning up a bit, and maybe throwing a couple pieces. I ended up throwing 4 mugs (beer sized), one vessel that I plan to use for tools in the studio, and fun beehive vase. And then I trimmed last night’s bowl and did some work. By the time I finished, today’s pieces were ready to trim and add handles. So, at this point, I have 7 pieces and a goofy sign slab drying out. Not bad for the first day. It’s official, the setup phase is over. It’s now a working studio. While there are still things to be improved or added, there’s enough done that I can make pottery, and that was the main goal. I’m really pleased with the way to space works and with the tools. And I can hardly wait to do the first firings.